Taste test: This party mix got very high marks from all tasters, and everyone kept coming back for more. A great variety of shapes and textures, and lots of cheese taste, made it quite popular. The mix includes crunchy cheese curls, small knot pretzels, cheese-flavored Ringolos, cheese tortilla chips and one more type of snack that people had a problem describing. 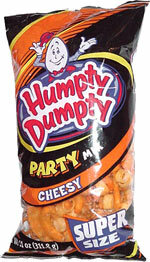 The consistency of this mystery snack was similar to cheese puffs, such as the Humpty Dumpty Cheese Sticks, but it had sort of a thin, scoop-like shape, vaguely similar to the shape of many pork rinds, but cut in half, so that it was narrow. All of the items tasted very good (all except the pretzels had cheese flavoring), and the combination of them together was excellent. Smell test: Strong cheese smell, sort of a mixture of cheese tortilla chips smell and cheese puffs smell. From the package: Ingredients include Hydrogenated Canola Oil, Cheddar Cheese, Tomato Powder, Romano Cheese, Autolyzed Yeast Extract, Pamesan Cheese, Ground Spices and Calcium Hydroxide.